It’s been almost twenty (20) years since Entrée to Black Paris began offering museum tours that feature images of Africans and persons of African descent in European Art. The most popular by far is our private, guided visit to the Louvre, led by Françoise, our trilingual, nationally-certified guide. This tour has never failed to surprise and delight those who embark upon it. Françoise presents over 20 works during the visit, and her list is not exhaustive! During a recent walk-through, she and I were thrilled to find that several “new” works that portray blacks have been hung in one of the rooms on the tour. Perhaps the most popular work on the tour is the exquisite Portrait of a Black Woman (Negress) by Marie-Guillemine Benoist. According to the scholarly work entitled The Image of the Black in Western Art (Harvard University Press, 1989), Benoist was one of the very few women to depict a black person in a painting prior to the 20th century. In another room, the monumental Raft of the Medusa by Théodore Géricault depicts the events following the shipwreck of the Medusa, a French frigate with over 400 passengers on board that ran aground off the coast of Senegal in 1816. During the course of the scandal that ensued, it was discovered that an ulterior motive for the voyage was to reinstate the French slave trade on an island off the coast of Senegal. Géricault based his work on the accounts of two of the survivors of this naval catastrophe. He portrays several black and white men on a raft, with a black man at the top of the human pyramid waving a cloth at a rescue ship on the horizon. Numerous paintings show blacks in Oriental scenes. (The “Orient” refers to North Africa and Egypt as opposed to the Far East.) 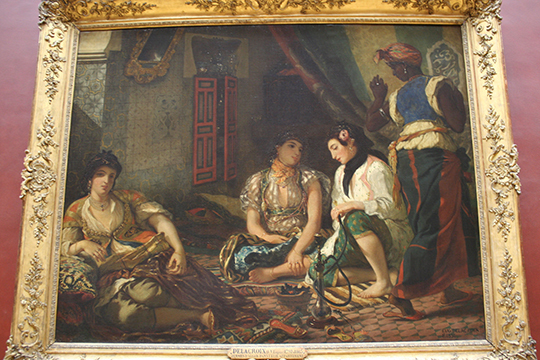 Well-known examples include Women of Algiers in Their Apartment by Eugène Delacroix and Jean-August-Dominique Ingres’ The Turkish Bath. Lesser known examples include several paintings by Théodore Chassériau, such as Arab Horsemen Carrying Away Their Dead after a Battle with Spahis. The Louvre has several paintings with religious themes that depict blacks as well. 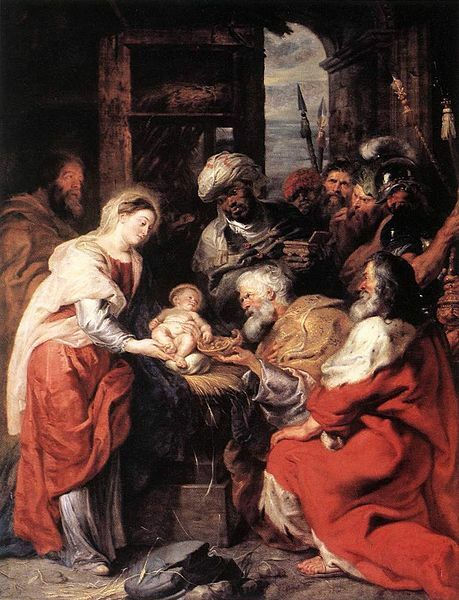 Prominently featured during the tour are many paintings of the Adoration of the Magi. The black magus is portrayed in various ways and is always placed in a central position on the canvas. Eustache Le Sueur’s The Preaching of Saint Paul at Ephesus is a 17th century painting depicting a black man tending to the burning of books (in the foreground) while Paul preaches from a porch in the center of the painting. In The Sermon of Saint Stephen by Vittore Carpaccio, a young black man is shown in the center of the painting. 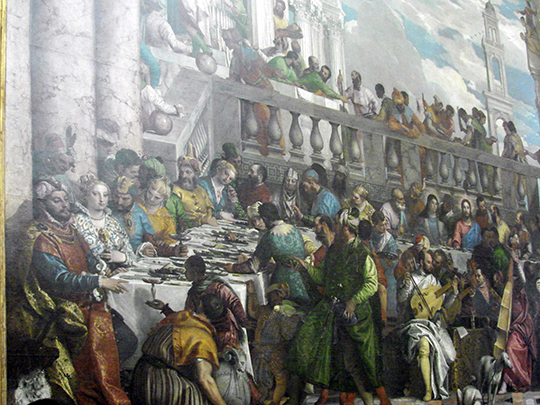 And in the Wedding of Cana, Veronese included multiple black servants in his depiction of the feast. “Black Images in European Art” at the Louvre provides a fascinating introduction to the ways in which Europeans have portrayed Africans and persons of African descent in their art. The 1½ -hour tour focuses exclusively on paintings and takes visitors through all three of the museum’s wings. 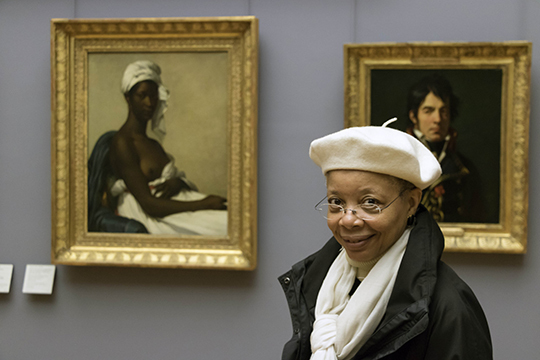 For more information about Entrée to Black Paris’ “Black Images in European Art at the Louvre” tour, send e-mail to paris@entreetoblackparis.com. In your message, please indicate the anticipated date of your arrival in Paris, the anticipated date of departure, and the number of persons in your party.